Lasagna just got more fun to eat! This is a healthier lasagna when using low fat ricotta and other cheese. You could ask try using whole wheat noodles! The kids also love them rolled up and it makes serving them that much easier! Preheat the oven to 350°F. Put ½ cup of the marinara sauce on the bottom of a 9 x 13-inch baking dish. Lay out the noodles on a clean surface. Make sure they are dry. Add ¼ cup of filling to your noodle. Spread it out so it covers the whole noodle. Roll up your noodle carefully and place seam side down onto the prepared baking dish. Repeat with remaining noodles. 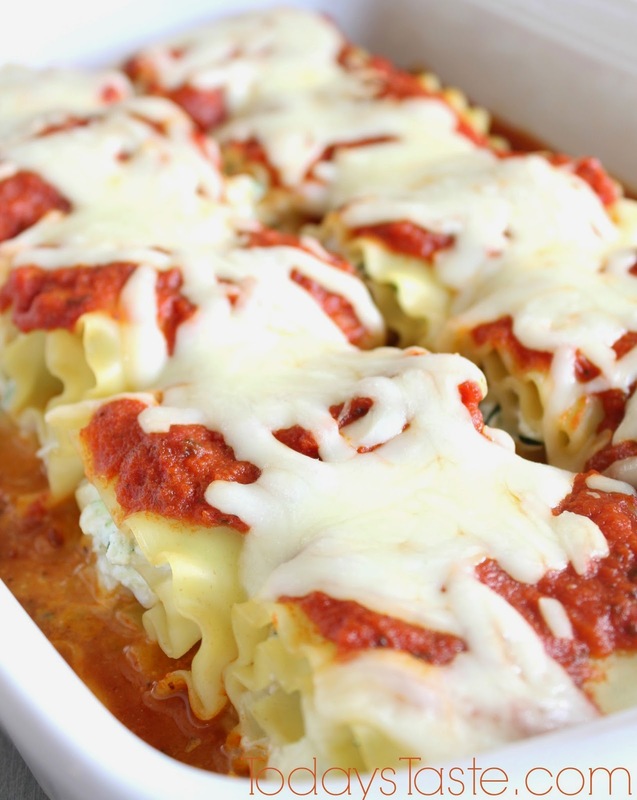 Ladle the remaining sauce over the lasagna rolls and top each one with 1 Tablespoon of mozzarella cheese. Put foil over baking dish and bake for about 30 to 40 minutes, or until the inside is heated through and the cheese is melted.